Summary of Content: Includes four related letters: 1. Roosevelt letter to Walter S. Field 3/10.1910. 2. La Follette, Robert M. TLS: Washington, D.C., to Theodore Roosevelt. 18 January 1910. 1 p. re: land formerly belonging to Kickapoo Indians. 3. Field, Walter S. TLS: Washington, D.C., to Theodore Roosevelt. 21 January 1910. 2 p. re: request to represent Roosevelt in Kickapoo land dispute. 4. Teller, Henry Moore. TLS: Washington, D.C., to Theodore Roosevelt. 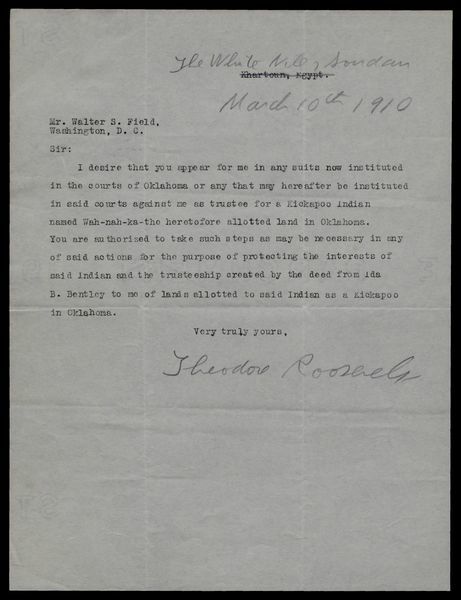 26 January 1910, 2 p. re: urging Roosevelt to allow Walter Field to represent him in the Kickapoo land dispute.